OMA is an international practice operating within the traditional boundaries of architecture and urbanism. the firm is led by nine partners – rem koolhaas, ellen van loon, reinier de graaf, shohei shigematsu, iyad alsaka, david gianotten, chris van duijn, ippolito pestellini laparelli, jason long – and maintains offices in rotterdam, new york, beijing, hong kong, doha, dubai, and perth. OMA-designed buildings currently under construction include taipei performing arts centre, the renovation of kaufhaus des westens (KaDeWe) in berlin, qatar national library, qatar foundation headquarters, bryghusprojektet in copenhagen, fondation d'entreprise galeries lafayette in paris, and prince plaza in shenzhen. running parallel to the practice, AMO, a research and design studio, applies architectural thinking to 'domains beyond'. 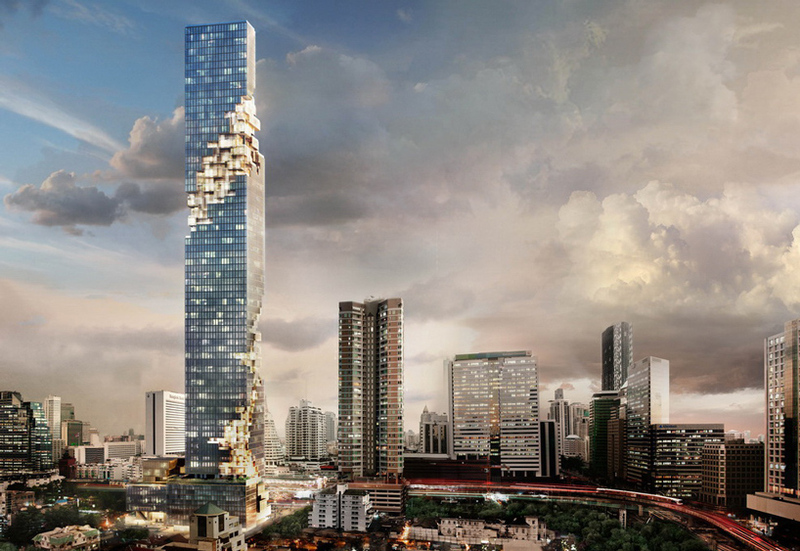 ole scheeren of OMA has unveiled plans for maha nakhon, a 77 storey skyscraper that will be the tallest building in bangkok. the complex at 150,000 square meters (approximately 1,6 million square feet) is a series of components that comprise mahanakhon square, a landscaped outdoor public plaza intended as a new public destination within the city; maha nakhon terraces, 10,000 square meters (nearly 110,000 square feet) of luxury retail space with lush gardens and terraces spread over multiple levels for restaurants, cafes and a 24 hour marketplace. also included is the ritz-carlton residences, bangkok with 200 highly-customized single-level and duplex homes, each offering the atmosphere of a skybox penthouse and the bangkok edition, a signature boutique hotel with 150 hotel rooms, a collaboration between marriott international and renowned hotelier ian schrager; and a multi-level roof-top sky bar and restaurant. with its distinctive sculptural appearance, mahanakhon has been carefully carved to introduce a three dimensional ribbon of architectural ‘pixels’ that circle the tower’s full height, as if excavating portions of the elegant glass curtain wall to reveal the inner life of the building metaphorically and actually an architecture that encloses and protects its inhabitants while revealing the inner life of their city. the 7-storey area of the tower’s base houses luxury retail and dining areas. here mahanakhon’s architecture is articulated to evoke the shifting protrusions of a mountain landscape. the building also features an adjacent freestanding 7-storey building known as the cube, with multi-level indoor/outdoor terraces offering a network of social spaces with an extensive and carefully selected mix of dining and leisure facilities that serve the general public will have acces to via a direct above ground pedestrian link to the main cbd skytrain station and plaza-level access. looks like half destroyed building by tornado. do we really need these clever tricks in future urban context? hmm..also it looks like half copy of 56 leonard, new york by HndM..
come on starchtects! show us some original design. maybe you guys are to busy to traveling rather than seating on a table. im sorry but how is this not original? do you have any idea how hard it is to innovate in designing skyscrapers? I think that the design is pretty succesful ! I like Axis Mundi’s Moma tower better, let’s get something different! The way how smaller spaces stand out from the ‘skyscraper’ as villa types is wonderful, especially considering you are way above the ground level. I think this project will make quite a change in typology of a skyscraper. this isnt very original, but its a start. at least some people are looking outside that dam horizontal box grid and thinking about its possibilities of complexity. we need to get away from the stack technique! its soooo banal, and makes life soooo boring. the vacation home is built for a family with two adult children.